The last of the summer peaches. With the foggy mornings we've been having this week, you think I'd be tempted to embrace an autumn themed menu with apples and quinces, pot roasts and mashed potatoes. But I'm not ready for autumn just yet. Here in the valley, March is harvest time, the days are still warm, and we're bursting with the best of the late summer produce. The tomatoes are still coming thick and fast, there are inky dark plums, paper skinned tomatillos, autumn raspberries and the last of the summer peaches. Every surface in the kitchen is filled with boxes of produce waiting to process. Tomatoes into sauce, plums into jam, and there is also half a cow from my neighbour, waiting to be turned into sausages. Currently distributed across three boxes sitting on the table, the cow will have to sit there until I find some space, any space, in the fridge, in the freezer or in the beer fridge and put it aside until sausage day. Though I ought to be content with this lot, I just can't say no to another box of produce, thinking somehow I'll figure out a way to make the time and space for it to fit. Since it is a good ten months of only eating apples ahead before the stone fruit return, I didn't hesitate to buy another 20kg of summer's last peach, the O Henry. A giant, fat slipstone that's perfect for bottling and one of the very last peaches to ripen, around mid March, the O Henry gets all that summer sunshine to grow and develop a big luscious flavour. I also couldn't resist a bag of Golden Queens, a deep yellow peach that are just well, peachy. They are the type that are put into tins, so they have a lovely nostalgic flavour for me, as I grew up eating tinned peaches. However with all those O'Henry's bottled on the shelf, I think we'll eat the Golden Queens now, roasted with butter and brown sugar and poured over hot crispy waffles. There's a lot of juggling here in the kitchen at this time of year, rotating space on the cooker for the preserving pot, the giant vat of tomato sauce and stewing plums for porridge, juggling fridge space, bench space, then shelf space for the jewel filled jars. But it's all so worth it, when the pantry shelves are full and we have plenty of delicious things to eat over the winter. When all the the boxes are emptied and the jars are filled, and there's finally space in the fridge, that's when I'll feel ready for autumn. That's when I can turn my attention to the quinces and apples. That is unless the sweet corn shows up. PS. A note re the image, we have shockingly slow internet right now, and that one image took 45 minutes to upload. Yes it's roasted plums with butter and brown sugar, there's not a peach insight, despite the title of this post. But I hope you get the picture anyway. I love the sound of your kitchen right now! It must smell glorious! I walked passed the F&V shop the other day & they had the $10 box of tomatoes. I stopped, picked a few up, smelt them but then looked at stroller & the toddler standing next to it. It already had a box of nappies & 8 library books loaded up on it & I didn't think I could kick the lady toddler out of it to load a few boxes in & get us all back to the at in one piece. I'm going back tomorrow, sans the two toddlers & stroller, to grab a few boxes & get some more sauce bottled over the long weekend. An over flowing kitchen is always preferable to an empty one right?! I love reading your posts. You make your kitchen and home sound so magical and far far away from the hustle and bustle of city life, it's lovely to read after battling peak hour traffic. Although I am welcoming Autumn with open arms with the cooler nights here in Sydney (the humidity has finally gone!!) I will miss the summer produce of stones fruits and tomatoes that smell so fragrant you want to bottle the stems with fruit. What?! Why is your internet so slow?! I would love to have a peek at your kitchen if you get the chance to take a photo. It sounds like a stressful, but exciting dream. Happy end of summer, and beginning of autumn to you and yours. Ah I've been so busy I've missed everything this season. It's the lowest my pantry's looked in some time! 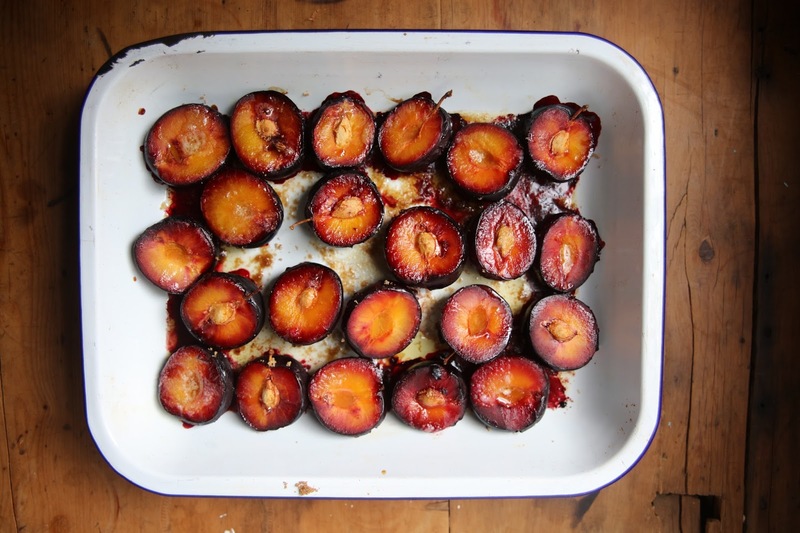 YUM - those plums look perfection. We had such a glut of peaches from our tree this year. I even said I'd deliver peaches to my instagram followers and ended up dropping off around 10 kgs.